Inside this pot is a well browned extremely lean 4 pound top round roast on its way to becoming one of my family's favorite comfort meals - Italian Beef. It's a dreary rainy day and just perfect for simmering this wonderfully aromatic roast. 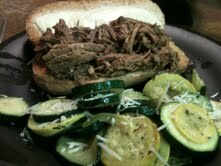 Will serve it on hoagie rolls toasted with melty provolone cheese . Sometimes I'll saute a bunch of onions and sweet red peppers in olive oil for an extra topping, but today I think we'll just do the meal in all its simple glory. 2 tablespoons of Canola or Grapeseed oil for browning the roast. 4.5 oz jar chopped garlic, if you are a fresh garlic purist, smash or chop and add 6-8 garlic cloves of decent size as a minimum. Fresh garlic is stronger in flavor so you don't need quite as much. I like the mild flavor that jarred garlic adds. Trim the fat off the roast and then wiped dry with a paper towel. Heat the oil in a very large pot over medium high heat. Brown the roast well on every side in the hot oil until every bit of the roast is browned. Don't turn too often as contact with the hot oil is what will make the roast make the delicious brown bits. Check after a minute or two but do not turn until each side looks like the pic below. If you did not trim your roast, you may have a lot of oil in the pot. If so, remove the roast to a plate with sides and pour off the excess fat. Return the roast to the pan with all juices. Lower the temperature to medium low and add the stock, bay leaves, oregano, fresh cracked black pepper, garlic (yes use an entire 4.5 oz jar), and several shakes of Worcestershire sauce. Bring to a simmer, then reduce the temp to low, cover the pot and simmer two hours. 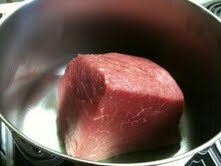 After two hours, start reducing the size of the roast by slicing it into smaller chunks every half hour. I usually just use a small knife and fork - pick up a chunk and place it on top of another to protect the pan and slice away. After the pieces have been reduced and the meat is fall apart tender, you are ready for the great Forking Event. This is where you take two sturdy forks and pull apart the strands of meat until it looks like what you get with a pulled pork sandwich. 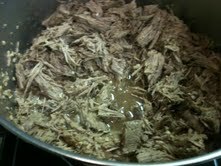 One thing you will notice is that as you pull the beef, the sauce gets thicker. This is a fine thing indeed. 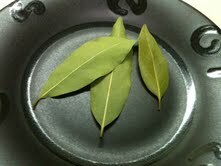 At this point, remove the bay leaves, taste, and adjust the seasonings. Some of you may like more Worcestershire, maybe add more black pepper, or some dried parsley or a pinch of oregano (but not too much). You might notice I did not add salt, some of you will require it and should add it now - but really, the Worcestershire sauce has a little sodium so why bother? Your blood pressure and your doctor will thank you. 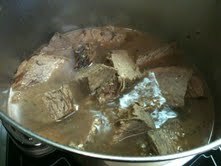 If there is too much liquid, simmer it uncovered until the sauce reduces a bit. If the liquid reduced too much, you can always add more stock. 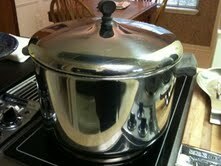 Keep it warm on the stove til dinner or refrigerate for heating later. Slice and open hoagie buns, top with smokey provolone cheese and toast open face in the toaster oven til the buns and cheese are as toasty brown as you like. Fill with the beef, a drizzle of stock, maybe add a bit of sauteed onions and peppers sauteed or not, or even some of that great new thick Worcestershire sauce . Mmmmmmmmm. According to my son, when I told him I was going to post the recipe on the blog - "there's not going to be a better one out there." Enjoy it very mindfully indeed.